Philips BM6B review | What Hi-Fi? Are you reading this and, at the same time, thinking ‘is there a Bluetooth speaker system, which, at the tap of a button plays the same music in up to five different rooms’? Well, the answer is ‘yes’ and this Philips BM6B is it. For those not looking for multi-room, no matter, the Philips stops at one, too. The BM6B is part of Philips’ ‘izzylink’ multi-room series – can we please call it izzy from hereon in? Users can start with just a single speaker. To create a super-simple multi-room system of up to five units, simply add further izzy speakers. To create your network, give the ‘Group’ button a long press. The Philips izzylink forms its own network, without the need for a router, wi-fi password, or mobile app. 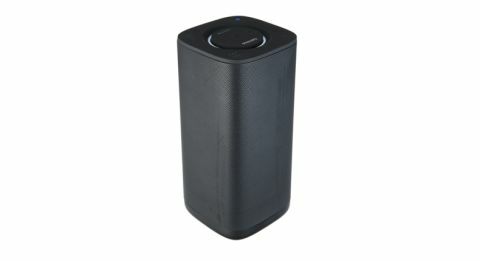 In each izzylink set-up, any individual speaker can be the master, streaming music to the others. To take charge, hit your speaker’s Bluetooth button and, quicker than you can say, ‘is Bluetooth better than Wi-Fi?’, you're in business. Your izzylink network now listens to the music on your device. If your choice of Metallica’s Hardwired doesn’t meet ‘izzylink approval’ other users can opt out of the multi-room chain, reverting to single speaker use. So far, so whizzy izzy. We do wonder, though, just how many users want to play the same music in five different zones, especially without the likes of intuitive apps and control systems? In reality, we’re imagining a ‘one in the kitchen, one in the living room’ scenario. In addition to its multi-room skills, the Philips doesn’t mind the odd splash – rated IPX4 it isn’t going to join you in 20 lengths of the pool, but it will happily cope with a misty moor, or – more likely – a misty bathroom mirror. It’s also fully portable – not so many multi-room systems can claim that – with up to eight hours’ Bluetooth and four hours’ multi-room play available from a fully fed izzy. And there’s more. For those listening with a buddy, it’s possible to simultaneously pair two music devices. The result is you can stream music from either device without the hassle of un-pairing and pairing. Handy for sharing sorts – though we always thought that the rule of the speaker was ‘he or she who owns the speaker plays the tunes'? Tested as a single unit, our Philips izzy, having impressed with its extensive list of multi-room and multi-user capability, lets the side down a little. Perhaps too much of the design budget has gone towards features, but the result is a speaker that lacks excitement. Play Candidate from Bowie’s Diamond Dogs and the Philips is unable to deliver the track’s rising tension and increasing pace. One issue is the Philips speaker’s cramped sound field – a tune like this needs space to breathe, and the Philips seems unable to relax and go with the flow. It does uncover detail – this is a busy track, and in this you should be able to identify individual strands – but homing in on disparate sounds is too much like hard work. Move from Candidate into Sweet Thing and treble can sound brittle. Keep on trucking into Rebel Rebel and izzy leaves you wanting for more get up and go. Overall, the Philips doesn’t sound bad – far from it. But at this price it’s up against some seriously talented rivals; both the Audio Pro Addon T3 and the Cambridge Audio YOYO (S) show it clean pairs of audio heels. This all means that its reasonably detailed, and controlled sonics don’t rock our world. If sound performance is your be all and end all, you may wish to pass on the Philips BM6B. It’s also unlikely that its plain, upright looks will let your eyes overrule your eyes. But – yes, there is always a but – if you are looking for an extremely straightforward multi-room system, one which also enables single-zone listening, then stop and give this offering a closer look and listen.